There was quite a sizeable earthquake off the west coast this morning local time (Lunchtime actually, even our Earthquakes are too laid back to get up early). All the fun happened about 145 miles away, a few miles out from Nootka Island on the Western side of Vancouver Island, which is mostly unpopulated. 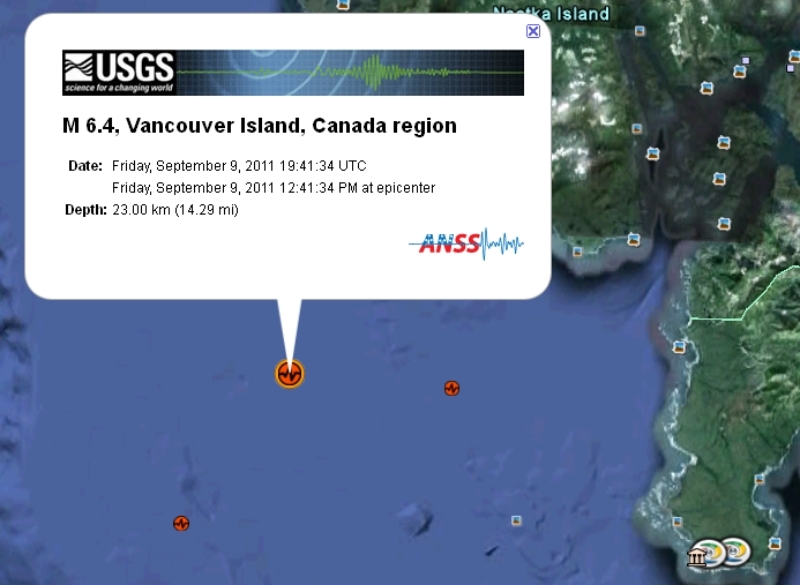 In town no one seems to have felt a thing, and there’s no news from Tofino of any Tsunami. “Hear about the big quake?” Someone asked as we gossiped in the grocery store checkout line. A number of people shook their heads, although one of the local hypochondriacs recounted a tale of her house shaking. No one seems to have been hurt, or even mildly inconvenienced, at least in our part of the mid island region. Panic over. Time for a beer.